What is an Air-spade? The air spade is a state of the art excavation tool that is revolutionizing the arboricultural industry. The air spade uses great volumes of compressed air to remove and break up heavy compacted soil. The air spade is powerful enough to break apart hard clay, yet delicate enough to leave even the most fragile roots, cables, and utility lines intact. Root Collar Excavation: The root collar is the area of the trunk just above the roots. The root collar allows for water and nutrients to travel between the roots and the other major structural elements of the tree: trunk, limbs, and even foliage at times. If this portion of the tree is submerged under soil or mulch, it can be detrimental the tree’s health. If the root collar is buried; constant walking, driving, and simply time will compact the soil over this part of the tree. Compaction of soil surrounding the root collar will suffocate and kill phloem cells, which are responsible for the movement of food from the leaves to the roots. If this compacted soil is continuously over-saturated it can lead to additional problems with the roots. High saturation in soil around the roots can effectively “drown” the tree, thus causing the roots to rot and decay over time, weakening the tree’s foundation and creating a potential hazard. Root collar excavation is done with an air spade to safely remove soil or mulch from around the root collar without causing damage to the tree. Soil aeration is essential to maintaining proper flow of water and nutrients through the soil and around the roots. Root Protection: As a homeowner we cannot always predict when we need to make changes to our home or property. In the event that you add an addition onto your home, put in a patio, deck, shed, pool, or even septic system, nearby trees may be drastically impacted. These problems may not be immediate, causing them to come as a surprise. During construction, if a major root of a tree is cut and dies, it can dramatically affect the integrity of the trees stability. This could weaken its structure and make the tree a potential hazard in the future. You and Your family’s safety is Mountain Tree Service’s number one priority. Give us a call and we will send out one of our certified arborist to give our expert opinion and assess the situation. If necessary we will use our air spade to expose the root flare of the tree to get a better idea of the trees root system. Potential outcomes of this type of conversation could include: Tree Removal, Tree Planting and Transplanting, or possibly a best case scenario, your tree is SAFE! Please feel free to search the bolded keywords to learn more about our services. Soil Invigoration: Soil Invigoration is a type of treatment for Declining trees, or Construction-Impacted Trees. This method is used to break up compacted soil that can be harmful to the tree. Nutrient rich organic material is incorporated into the soil. 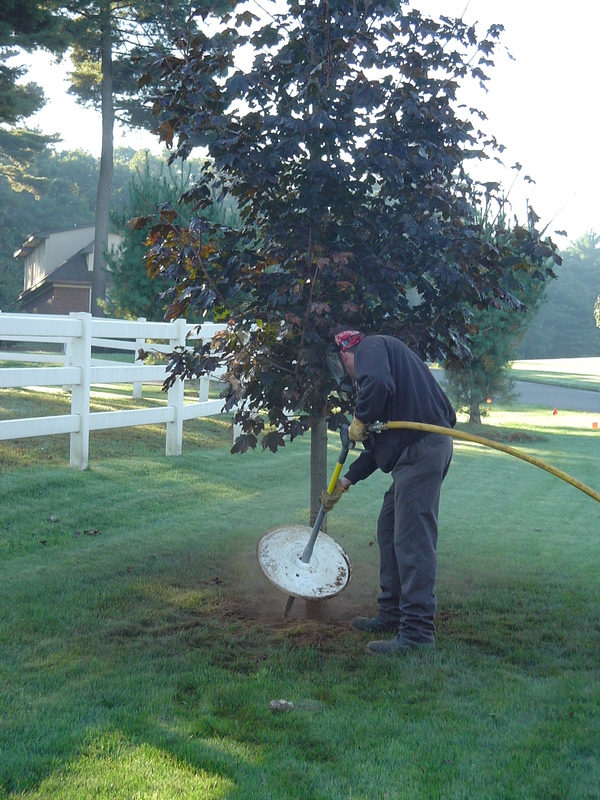 One method of soil invigoration that is practiced by Mountain Tree Service is Radial Trenching. Radial Trenching is a technique that replaces existing soil and provides trenches or channels for root growth. These trenches are created by an air spade. These trenches are then filled with the organic material that will help channel and provide nutrients back into the tree. ATTENTION: Radial Trenching does not have an instantaneous result; it is a long term resolution and is still not a guarantee. Radial Trenching is one form of soil invigoration that Mountain Tree Service has experienced and seen the most profound effect.